For the past five or six years, we’ve had a camera in our American Kestrel nest box. It’s been great fun each spring as we turn into peeping Tom’s, sneaking peeks into the secretive world of these beautiful little falcons during the nesting season. Weighing a mere quarter of a pound or so, these diminutive raptors are closely related to the Peregrine Falcon. 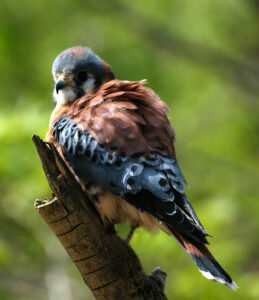 Due to their being much smaller than most raptors, kestrels frequently go unnoticed. Often perched on electric wires to scan their hunting areas, they are often mistaken for Mourning Doves. While hunting over open grassland and farm fields, the birds may hover like a helicopter before diving to the ground snatching their unsuspecting prey with their sharp talons. During our years of observing the nest box, we were surprised at how many snakes arrive at the box. Much of their diet consists of small-mammal prey such as mice, moles, and voles. They also consume many insects. These little raptors were previously known as Sparrow Hawks, so they do take small birds on occasion. Once plentiful across the United States, like many animals, the kestrel has been on the decline for a variety of reasons including lack of adequate nesting sites. There is a lot of competition among cavity nesters for that perfect nest site. The first year we put our box up it was immediately claimed by a pair. This may not always be the case but for our nest box, it has been occupied every year. If you would like to see what’s going on this spring in a variety of nest boxes around the country visit: http://cams.allaboutbirds.org/. Cornell has several nest cams with plenty of action already this spring from owls, hawks, ospreys, and there’s even a fluffy new chick in the endangered Bermuda Cahow’s underground nest. It’s also great fun to watch the feeder cams. There are a fruit feeder and a hummingbird feeder in Panama where you can see an array of beautiful tropical birds as well as seed feeders in Ontario and at the Cornell site in New York. Yesterday we saw our pair of kestrels mating on the electric line near the box so we should have an egg in the box soon. Last year we had our first egg on March 26th.